Finally, a usable way to type for Handheld computers, PDAs, and Cell Phones! Imagine having access to the whole world of information in your hand - everything from a 2-way alphanumeric pager, e-mail, phone book, calendar, notepad, and to-do lists. Now imagine that you can access this information AND CAPTURE NOTES AND IDEAS anytime, anywhere -- even while walking, driving, running, lying down, or even waiting in line at the airport. NO MORE tiny, klutzy keyboards that are inaccessible even when seated at a desk! Instantly accessible - wears like a 2-way pager, but works like a pocket organizer - all in the palm of your hand! Capture information faster than any other pocket organizer -- faster than Palm Pilot, Blackberry, or Pocket Windows! Extremely easy to use - most people learn the alphabet in only a few hours (same learning curve as Graffiti). 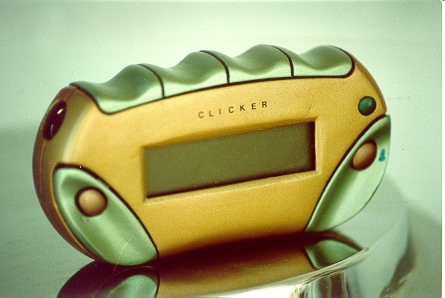 In a nutshell, the Data Egg is the answer to the current trend of continuously shrinking portable devices -- 2-way pager, pocket organizers, for example -- all of them too small to type on, and none of them accessible unless you're sitting down and anchored to a desk. Originally developed by Gary Friedman of NASA's Jet Propulsion Laboratory as a keyboard for astronauts, the Data Egg is now poised to forge the next wave in Personal Information Appliances. 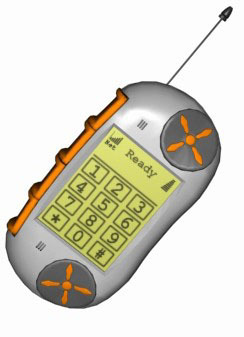 Having solved the keyboard barrier problem, the Data Egg for the first time will enable the merger of 2-way pager, phone book, notepad, calendar, e-mail, alarm clock, language translator, and a host of other specialized functions to all co-exist in one self-contained, handheld device that can easily capture as well as retrieve information on the fly, regardless of position or activity. The Data Egg's "keyboard" consists of seven buttons (at least 3 for the thumb, 1 for each of the remaining fingers) wrapped around a shape that's easy for the hand to hold. The seven buttons are pressed in different combinations, much like playing chords on a piano (hence the name 'chording'), and can be used to type all letters, all numbers, all punctuation -- pretty much anything one can type on a typewriter. The Alphabet is also easy to learn since the shapes of the letters resemble the button patterns that are pressed. 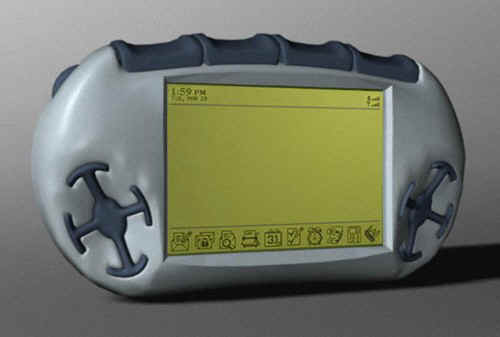 The first physical prototype had the buttons mounted onto an Easter egg, hence the name 'Data Egg' was born. The applicability of the Data Egg to everyday tasks is unending; and properly marketed, the Egg can have the same impact on society as have the microwave oven, the pager, credit card, and the spreadsheet. 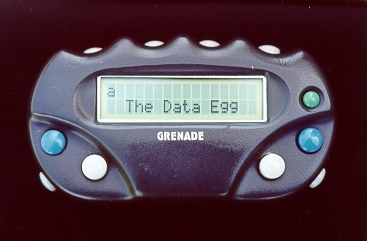 UPDATE: After pursuing this idea for more than 15 years, as of January 1, 2005, development on the Data Egg concept has ceased. 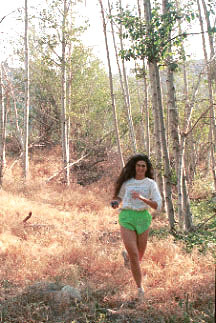 There are no prototypes or schematics that can be shared. This site remains up in the hopes that someone else will grab hold of the idea and run with it. Originally designed for astronaut use, the Data Egg has many down-to-earth applications for position-independent activities.